Global substation automation market is witnessing a robust growth due to the increasing demand for electricity to be transmitted and distributed efficiently across the world. In order to achieve the goal of efficient transmission and distribution of electricity, the automation of substations is required. The conventional electric grid does not support two way communication, however, if the substation is automated, then two way communication becomes possible that helps to reduce transmission and distribution losses. In order to make the electricity substations automated, the use of equipment such as specific software, special sensors and equipment that facilitate two way communication is entailed. In addition, there is a use of intelligent electronic devices such as protective relays, programmable logical control, digital transducers, etc. are also used. Such type of equipment help in the monitoring and controlling of substation equipment. Also, with the help of such equipment, the incidences and duration of power outages are reduced. According to the assessment of Future Market Insights, the global substation automation market is forecasted to reach a figure of about US$ 142,900 Mn in 2022 and is poised to exhibit a robust CAGR in the period of assessment. The market in North America is set to dominate the global substation automation market in terms of value and this trend is projected to sustain itself throughout the assessment period. North America substation automation market is the most attractive market, growing at a robust CAGR over the forecast period. According to the projections of Future Market Insights, the intelligent electronic device segment is expected to reach a value of about US$ 104,750 Mn in the year 2022. This signifies a robust CAGR during the forecast period of 2017-2022. The intelligent electronic device segment is estimated to account for more than three-fourths of the revenue share of the module type segment by the end of the year 2017 and is expected to lose market share by 2022 over 2017. According to the assessment of Future Market Insights, the programmable logical controllers segment is poised to touch a figure of about US$ 30,350 Mn in the year 2022. This signifies a CAGR of nearly 7% during the assessment period from 2017 till the year 2022. The programmable logical controllers segment is estimated to account for more than one-fifth of the revenue share of the component type segment by the end of the year 2017 and is projected to gain market share by 2022 over 2017. The report also profiles companies that are expected to remain active in the expansion of global substation automation market through 2022, which include ABB Limited, Cisco Systems, Inc., Eaton Corporation Plc, Schneider Electric SE, General Electric Company, Siemens AG, Alstom SA, Echelon Corporation, NovaTech LLC and Encore Networks, Inc.
Future Market Insights delivers yet another unbiased, comprehensive and insightful report titled ‘Substation Automation Market: Global Industry Analysis (2012-2016) and Opportunity Assessment (2017-2022)’. In this report, the global substation automation market is explored in great detail, and the market dynamics of the global substation automation market has been covered comprehensively, explaining to the report readers the drivers, restraints and trends operating in this highly competitive market. Also, analysis of the data over different parameters has been done in order to arrive at market numbers concerning the global substation automation market. Besides, competition landscape of the global substation automation market is also covered in this report, giving information about the key companies operating in the global substation automation market. In the first part of the report, the executive summary and the introduction are given. The executive summary gives a summary of the global substation automation market and gives the pertinent market numbers that are most significant, which include the historical CAGR growth from 2012 till 2016 and the forecasted CAGR from the year 2017 till the end of the forecast period in the year 2022. Information about lucrative markets from the point of view of leading revenue share and highest CAGR are also given in the executive summary. In the introduction section, the substation automation market is defined in detail so that the report readers are clear about the scope of this market. The next section of the report gives information on the key dynamics of the substation automation market. Key points covered in this section include the global economy, fiscal stimulus and bottom line of enterprises. In the subsequent section of the report, information is given on the cost structure analysis and pricing analysis of the global substation automation market. An analysis on the market presence of key participants (intensity map) is also offered in this section. The next part of the report consists of the global substation automation market analysis and forecast by module type, component type, technology and region. This section of the report contains important market numbers in the form of year-on-year growth comparison, market share comparison and revenue comparison. The global substation automation market is also analysed across key regions- North America, Latin America, Europe, Japan, APEJ and MEA. The last section of the report contains the competition landscape, where leading market players operating in the global substation automation market are profiled in detail. This information is in the form of company overview, product overview, key financials and key developments pertaining to that particular company. The competition landscape also features the SWOT analysis of the selected companies, which gives the report readers information about the strengths, weaknesses, opportunities and the threats that such companies operating in the global substation automation market are facing. The competition landscape is an invaluable part of the report as it contains all the necessary information to study the leading companies operating in the global substation automation market and how they implement their strategies and vision to stay in the pole position in this highly competitive market. 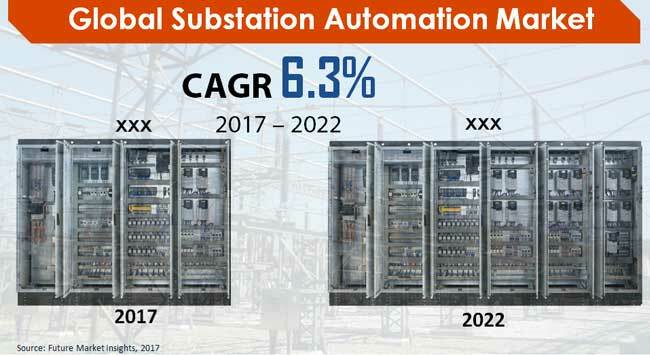 The report on the global substation automation market is backed by an exhaustive research methodology that relies on both primary and secondary research to gain all the necessary insights into the global substation automation market. This report is validated several times by the team of diverse, expert analysts of Future Market Insights using proprietary tools so that it can be used as an authoritative source by the esteemed clients of Future Market Insights.